It is an experience of a lifetime to travel the exotic locales of North-Western India on the royal luxury train Palace on Wheels. After being vacation-deprived for a while, I decided to get in touch with the Worldwide Rail Journeys to book my tickets to tour through the beautiful landscapes of Rajasthan. It had been a while that I wanted to set off to an unexplored destination, and finally the time to travel one of the most mesmerizing locations in India had arrived. The week-long vacation commenced from Delhi, the capital city of India and went on to Jaipur, Sawai Madhopur, Chittorgarh, Udaipur, Jaisalmer, Jodhpur, Bharatpur, Agra, and back to Delhi. After reporting at the Safdarjung Railway station and getting done with all the formalities, I was headed to my comfortable coach. As I settled in, I decided to visit one of the two resto bars in the train for a scrumptious meal as we headed to Jaipur. As the night faded in, I tucked into my spacious bed and decided to call it a night, but my heart could barely hold the excitement. The next morning, I woke up in the pink city and had my royal breakfast in true Palace on Wheels style. I set out to explore the colourful city of Jaipur and visited iconic places like the Amber Fort, the local markets, and embarked the train for tea and dinner. A day well spent and we were now headed to Sawai Madhopur that is popular for its Ranthambore National Park. The UNESCO World Heritage Site of the Ranthambore Fort was something that totally got me entwined in awe. Soaking in all the history and royalty was quite a soulful experience. Post lunch at the royal eatery in the train, I was looking forward to our next destination – Chittorgarh. The beautiful Chittorgarh fort was quite a sight to behold while I sipped some refreshing tea at the cafeteria there. 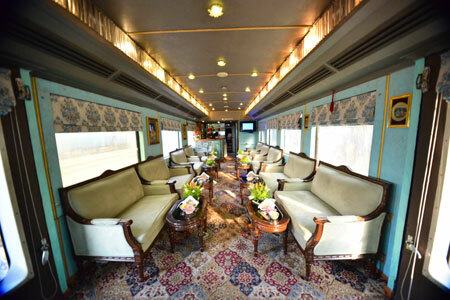 I returned to the train to enjoy a delicious dinner and decided to explore the interiors of the train that came equipped with 23 coaches and two super deluxe suites, 13 deluxe saloons, two resto bars, improved water supply and storage, boardroom and internet facilities, and international spa facilities. The next day unfolded when the train galloped into the city of Lakes – Udaipur. After a hearty breakfast at a deluxe hotel, my off-train excursion around the city began. A serene boat ride at Lake Pichola was a calm and relaxing experience. After touring this mesmerizing city, I was back on the train and we headed towards Jaisalmer. I feasted on a deluxe dinner on the train and realized that the foodie in me was truly enjoying this royal experience. On day five, we were in Jaisalmer – the Golden city. Named after Maharaja Jaisal Singh, who ruled the city in 1156 AD, this place reeked of its ancient history and legacy. Here, I took the opportunity to go on a camel ride to get a taste of the real desert journey. By night I was back in my cabin as we moved onwards to Jodhpur. Also known as the Blue City, Jodhpur was a spectacle in itself. Historically, this was the capital city of the Kingdom of Marwar. I spent time exploring the magnificent forts and buying souvenirs at the colourful local markets. After having lunch at a luxurious resort, I headed back to the train for a comfortable ride to Bharatpur. I woke up at the crack of dawn the next day to explore the Keoladeo Ghana National Park that is popular for bird viewing. A rustic breakfast at the forest lodge was an experience I would never forget. Back on the train and off we went to Agra for a short visit. After basking in awe of the Taj Mahal we headed to the nearby markets to buy antiques and the local sweet Petha. By evening I decided to gorge some local dishes in Agra before setting off for by final boarding on the Palace on Wheels. My journey now had finally reached its end, and all I could do while lying down was reminisce all the exhilarating moments I had lived in the past week. Day eight, the trained came to a halt at Delhi and I completed my formalities before getting off. This experience would not have been possible if the Worldwide Rail Journeys had not helped me get my tickets booked with great precision. Their competence and experience made the booking process a lot easier for me. At the end of the trip, my heart was full and the traveler in me was finally content. Explore the True Gems of India with Maharaja Express! Luxury train travel gets the balls rolling! When a palace on wheels carried me to Rajasthan. 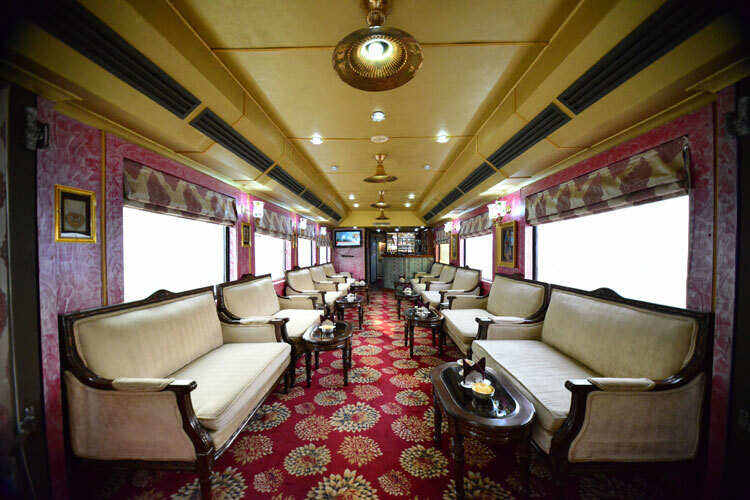 How A Trip on Palace on Wheels Helped Me Experience Royal and Grandeur to the Fullest!